Next Post The Tangled Web We Weave…is Actually Pretty Rad. 1. Self Compassion – We really really need to be as loving and caring for ourselves when we fail as we would be for our closest and dearest friend. 3. Self Support – I’m not sure why we always have to search outside for comfort, support and approval. This is the one I’m still working on, but when we can reach inside and not depend on others, then I think we have really cut the mustard. Wow. Jerry put it perfectly. I’m 43. My grandma just turned 94. We have lots of loving ahead of us! 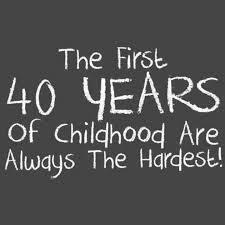 I’ve told you this before: My 40’s were my best years! With us being almost exactly 20 years apart, I am eyeing 60 and while the number is daunting, I wouldn’t go back a day. Life is a process… that never changes. I know I am “the one” who you think disapproves, but frankly, I wasn’t a model of perfection at 40 either. Nor am I at “59 almost 60” – but I can tell you that the gratefulness meter gets a good workout every day – I’m better at living in the moment – I’m better at knowing myself and what I need to be truly happy. I am more centered, more spiritual, calmer. I can’t wait to see you for your birthday. I love the woman you’ve grown up to be!! Beautifully written! I’m so touched by this and as usual, I don’t even know why. I do know that I am so happy for you and I feel so good about your future you are creating. Love and hugs to you.